Our friends at Road & Track managed to get behind the wheel of a prototype Elio 3-Wheeler, which, I admit made me a little jealous. I’m quite curious about that car. My jealousy rapidly changed into sympathetic cringing when, right during their Facebook livestream, one of the Elio’s fenders fell off. R&T cut off their Facebook Live feed when they realized, thanks to some awful noises and the odd disappearance of part of the car’s body out the window, that their Elio had lost a fender. From the driver’s seat, I can’t tell you much more than what you see in the video. The car’s pod fenders, mounted to the exposed front suspension A-arms, rattled over every bump and pothole we traversed. At some point, the left fender rattled itself loose, and when we hit a bump traveling west on 57th street in midtown Manhattan, the mounts let go entirely. The fender pitched forward, got pulled under the rotating front tire, and dragged along the road. It was not my proudest moment on video. With the fender jammed under the left-front tire, I wasn’t able to steer the car to get it over to the curb. So brave cameraman Chris Perkins and I cut the video, hopped out, rolled the car backward to free the fender, and limped our way back to our meeting point. To be fair to Bob, this could have happened to any journalist testing the trike, and even prototypes from big established manufacturers can have issues. But it’s not a great look for Elio, especially in light of is perpetual production delays. The Elio 3-Wheeler is an awfully interesting experiment. If the startup can pull it off, it will be an enclosed trike that drives like a car, gets 84 MPG and costs $6,800. Naturally there have been concerns about its build quality, and what happened during this live test drive today will not help. They informed me that this prototype’s fenders are removable to allow them to roll the car through narrow doorways for display purposes, and that the production design will use different fender mounts. 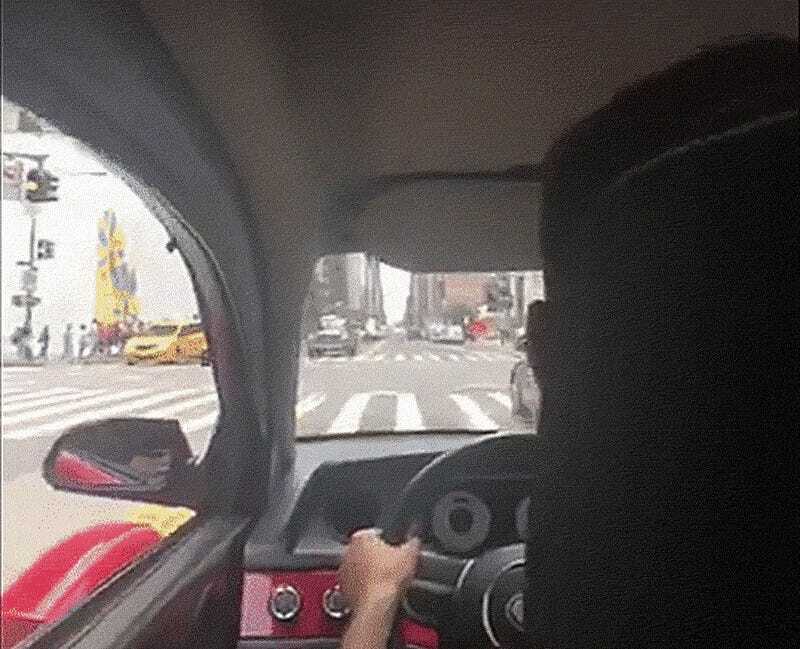 Looking at the Elio’s design, it appears that the front fenders, which move, motorcycle-like, with the front wheels, are mounted on two studs on what looks to be part of the upper knuckle there. If you look at the picture here, you can see that the fender is designed with a pair of tubes that must fit over some studs mounted to a bracket on the steering knuckle. Maybe there’s some set screws as well? It looks like it, but it’s hard to tell for sure. Regardless, something in this mounting system failed, which caused the fender to make contact with the tire, which seems to have dragged and rotated the fender forward, presumably dragging the upper painted surface of the fender into the unforgiving pavement. Now, New York streets can be brutal on pretty much any car, and this Elio is a pre-production vehicle, so we have to cut them some slack, after all. But, based on what we’ve seen from Elio in the past, I don’t think we have to cut them too much slack.